Go get your coffee. This one was written with rant mode in the ON positi0n. Full disclosure: I do not like Mr. Nordstrom. From the very first interaction I had with him on social media, he’s been nothing but arrogant and supercilious. I have had to keep him permanently mute on Twitter since he is incapable of a dialogue without being insulting. Require that charter schools provide transportation and school lunch. Clarify requirements that charter school demographics reflect those of the school district. Close charter schools that fail to meet integration goals. The first one is classic Nordstrom. He is well aware that charters currently do not receive the overhead funding for transportation that their traditional counterparts do. If he’s up for giving charters more money for buses, that’s great! However, I’d bet that his intention here is that requiring transportation would cripple and close a lot of charters. The second shows the complete lack of understanding of what school choice is by applying forced racial quotas. Revisit the tweet above – To Nordstrom, you are a racist if you want school choice. The third is just Nordstrom wiping the drool off his chin at the thought of a charter school closing regardless of the reason. Parents, how do you feel about this guy mocking you and suggesting to close your child’s school? Just a reminder, Nordstrom is a former NCGA researcher who was given a policy wonk title by the NC Justice Center. The NC Justice Center is the parent organization of Blueprint NC, a “non-profit” whose primary goal to “cripple” “slam” and “eviscerate” all North Carolina Republican lawmakers was exposed in 2013 through a leaked memo. Nordstrom’s “report” is more of the same. "New report" is from NC Justice Center – parent org of #BluePrintNC. and is about laying narrative groundwork. It must be nice to be Kris Nordstrom and apparently be a man with no children of his own dictating to those who do have kids on just how and where and how their child should be educated. On that same note, I understand that after publishing this hit piece that he and his wife headed out of the country to go backpacking. How nice for them. The title of the 23-page “report” is Stymied by Segregation. What follows the title is a non-stop set of attacks on school choice (specifically charter schools) using cherry-picked data with no population or demographic shift context. Without getting into the forest of weeds in Nordstrom’s report, let’s unpack these five claims. So which is it? The conflation here is probably not accidental. Are we talking about racial makeup or school lunches? If it’s the latter, the majority of schools in North Carolina qualify as “economically isolated” as the threshold to qualify for Free and Reduced Lunches dropped every year for seven years in a row starting in 2009. The “report” more than once aims to tear down school choice through the idea of forced integration. School choice hinges on the freedom of voluntary association, therefore that angle has to be attacked. The first part of this statement undermines claim number one, but now the issue is “economic segregation” – whatever that is since the term is used twice in the whole report and is largely undefined. There is just no pleasing this guy. Again, people move. Jobs move. They always have. They always will. Let’s see. We’ve done busing. How’d that work out? Ask Charlotte parents how they felt about their kids being bused 30 to 45 minutes halfway across the city in the name of ‘racial equality’. We’ve done magnets. So far, not really making a big dent despite the millions thrown at it. We’ve done charters and Opportunity Scholarships — WHICH ARE ACTUALLY WORKING. But you’re segregating our schools by going those routes according to the childless Kris Nordstrom. Are you kidding me with this one? Now county district boundaries are racist? Give me a break. As I said, there is no pleasing this guy. Finally, we get to the point of this smear job: Charter schools. First, There is no evidence of this whatsoever. To the contrary, charters in NC are as racially or more racially balanced than their traditional counterparts. According to the data, which Nordstrom omitted, charters in NC have a larger percentage of black students than do their traditional counterparts. But you parents, especially you minority parents out there, you’re racists because you want options for your kids. Cordes studied more than a decade’s worth of student achievement data for 876,731 students attending 584 elementary schools in community school districts in New York City (NYC) with at least one charter school serving children in similar grades. The Left hates school choice – unless it’s their choice. It is written by Dr. Tom Miller who has been a past consultant to the NC Department of Public Instruction’s Office Charter Schools. As a former traditional public school teacher and public charter school principal, I find reports like the one from Kris Nordstrom to be offensive and misleading. 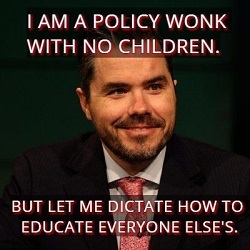 He represents public charter schools as a threat to public education and not as colleagues in education to their traditional public school counterparts. He also leaves out the most important stakeholder in his report–parents. Our world has evolved to a place where choice is part of all aspects of our everyday life in which apps we use, which cars we drive, and which neighborhood we live in. Why would the education of our children be any different? According to the 2018 Office of Charter Schools report to the legislation, public charter schools have a higher percentage of enrolled African-American students than does traditional public school. We have found that minority families are choosing charter schools because in so many neighborhoods, charters are the best school option for their child. Public charter schools have a higher percentage of schools with greater than 80% of their population being African-American or Hispanic when compared to traditional public schools (27% charters vs. 20% traditional). When just comparing African-American enrollment data, 13% of public charter schools have student populations that consist of 75% African-American compared to traditional public schools where only 5% have student populations greater than 75% African-American. The traditional public school percentage would be much higher if districts did not draw lines to create racial balance in their schools. Read the whole thing. You will not be disappointed. The Left Hates School Choice. Act Accordingly. School choice options remove the impressionable, moldable young children from liberal ‘drip, drip, drip’ indoctrination and place them into the hands of their parents. This boils down to power being shifted back to parents and for the Left, that has to be stopped. Democrats and the Left are in deep denial that our public school model is antiquated, outdated and has been for decades. There is also a deep degree of union protectionism inherent in this denial. Progressives and Democrats have entrenched themselves in the idea that public school is some kind of sacred cow that cannot be slaughtered. Well, guess what? Beef. It’s what’s for dinner. One has to wonder why Nordstrom wrote what is essentially a 23-page long virtue signaling attack on school choice. A decent thought about that is that it makes a nice piece of ‘that’s racist!’ fodder for the Governor’s sham Education Commission to attack the General Assembly with, right? This entry was posted in EDUCATION, LL1885, Parental Rights, Really?, School Choice, THE LEFT and tagged Kris Nordstrom, NC Justice Center, School Choice. Bookmark the permalink. That’s pure Leftist philosophy. No Choice about anything. Parents who send their children to charter schools are willing to assume more of the trouble and expense of their education in exchange for CHOICE in what meets their child’s talents and interests. Why isn’t Mr. Nordstrom demanding that the high school football teams be balanced racially? Or that every child be in the marching band? Or how about making sure that Special Ed classes, foreign language, and advanced math classes be racially balanced, regardless of kid’s abilities or desires?